Setting and Elements: "17th Century China"
Is About: The adventures of a shaolin monk who is forced to wander away from his monastery. I like the simplistic layout of the site, and how the title image blends with the background. The art is eye catching, if rather heavily styilized, and while I don't mind it for a humour comic it looks to me like this is an action-adventure one. I know some readers might get turned off by that. For some reason the mindset is that simplified = humour and action = realistic, but hey this is webcomics, the rules are made to be bent and broken. The main site is even more elegantly simplistic. In fact I like the current site design even better. Whatever else you might say for the creator, he knows how to make a site look clean, interesting, and new-reader friendly. Shi Long Pang is the tale of a wandering monk in ancient China. Yes I know that sounds ridiculously cliched, but this story is more than what it seems at first. The titular character is a lost monk, wandering around looking for survivors of his monastery after it was razed by an army convinced the monks were harbouring rebels. Aptly described by a city guard as "like a little pork bun", he seems rather nondescript, but as more and more of the story unfolds, we get to see more and more of how he fits into the overall picture of war, intrigue and politics. And wouldn't you know it, I go and pick a sample image that has the titular character cropped out. Uh... Oops. No that monk there is NOT Shi Long Pang. Like I mentioned before, the art at first glance seems over-simplified, but it is by no means simple. The colouring is beautiful, and although sometimes the facial expressions don't quite gel. But overall the art is subtle and effective. And the detail in some of the pages truly is epic. The fight scenes, (and there are many of them), are intricately done. It's pretty amazing, as is sheer amount of energy and fluidity in them. The more I read this the more amazed I am than the perspective and point of view the artist uses. It doesn't feel like a comic more, but a full blown movie and I'm in the middle of it. Quite an accomplishment. And that simplified style really does grow on you. I have to say though, I'm not a big fan of the use of screentones experimented with in the later pages though. They sort of go against the whole subtle nature of the artist's style. But it could be just teething problems. One beef I often have with comics set in non-American contexts is pretty much well... the mannerisms and characters in the comics are often pretty much American, transplanted into ancient Japan or Rome or whatever exotic place they are supposed to be in. 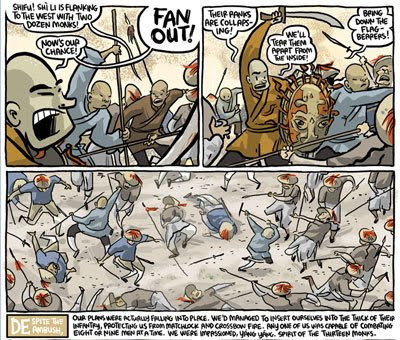 There's usually very little research done on what those places WERE like, so it's refreshing for once to see a comic that goes into this with such painstaking detail. I particularly like the use of authentic terminology, and the very reader-friendly footnotes that explain what they mean. Sometimes they are a little lengthy, but overall they give the comic a feel that I have very rarely encountered elsewhere. This, ladies and gentlemen, is writing with substance. Although some scenes weave crazily from tragedy to humour the storytelling, pacing and introductions are superbly done. I never felt overwhelmed with characters (who were all humbly lovable), and I loved how the story gradually built up and deepened. Politics and philosophy in particular, are very difficult subjects to tackle when it comes to comics, but the author carries it off very successfully here, and you can understand why things happen the way they do. On a personal note, I love the bilingual jokes. Yes I know most people will miss them, which makes it funnier for those who DO get them, I suppose. The layout of the panels, while most of the time artistic, is sometimes confusing. Attempts have been made to improve the readability by adding arrows and such, but in my opinion they didn't work that well. The eye travels faster than the amount of time it takes the brain to register the pointy arrows, so having read a panel or two and then having my eye jerked back to the correct path can get somewhat tiresome. Sometimes the walls of text in some pages are a little hard to read due to the hand-lettering (rest of the time, the hand-lettering's great though). Like I mentioned before, the simplistic style of the art might turn new readers off, but I really wouldn't change it for the world. Sometimes you can't pander to the lowest common denominator, and if they miss out on this gem, it's their loss, really. I didn't really expect to like Shi Long Pang as much as I did. You know a comic is good when you continue thinking about it after you're away from your computer and doing something else and you're still pondering about the storyline and your favourite pages. Yes, I didn't have great expectations of SLP, but the vaunted subtlety I keep talking about managed to get under my skin, and lo and behold, this one's going on my reading list. I'm going to leave the choice of the next leg open for the time being and make my decision on which comic I'm going to pick from the Shi Long Pang links page later. Unless you want to recommend one from there, of course. 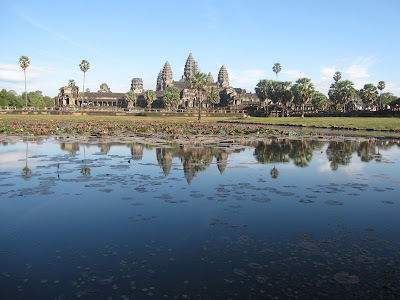 Stopover at Siam Reap: Angkor Wat! Sorry for the lack of posts recently but naturally I'm spending my holidays with my family overdosing on turkey and doing all those family thingies that people do. I also decided to take a break from exploring webcomics and switched to exploring a real life destination that was on the "list of things to do before I die". 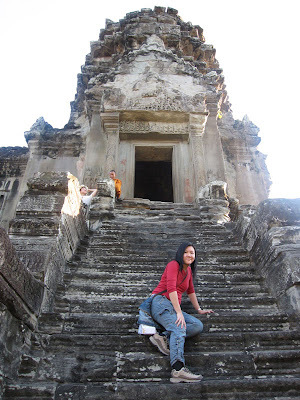 So I spent my Christmas and the few days thereafter in Siam Reap, Cambodia. 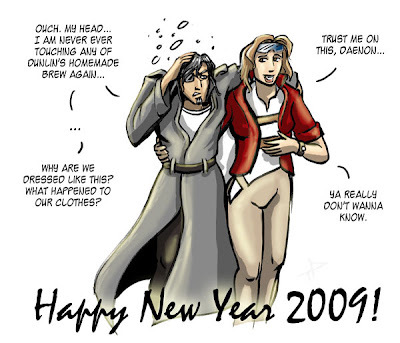 Just a fair warning, this post has almost next to nothing regarding webcomics. Prior to my trip I really didn't know much about Cambodia except for the tragedies of the Khemer Rouge, landmines and Angkor Wat. 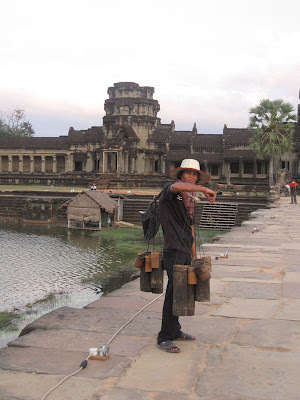 So visiting Cambodia, albeit as a touristy tourist, is something new to me. Siam Reap (meaning "The Siamese Defeated"), is called such after the Cambodians repelled the Siamese occupiers who had had hold over the land for a few hundred years. This is also why the tension between the Thai-Cambodian border is so tense at the moment, as the Cambodian fear a repeat of being under Siamese rule. Back to the topic, Siam Reap is not the capital of Cambodia (Phenom Penh is) but merits its own international airport due to its proximity to the much vaunted Angkor Wat. This is the place most tourists go when they come to see the famous temple. The advantage of a notebook and a well-stocked pencil-case is I can continue comicking while waiting in between connecting flights. Mind you, you may be subject to curious onlookers. It's amazing how random people start coming up to you and strike up a conversation when they see you drawing. I recently discovered the existence of chinese calligraphy brushmarkers, which are beyond awesome for inking on the run and will probably be what that makes me give up traditional brushes if I ever do. Have sketchpad? Never be bored! iPod is optional but recommended! This man was selling palm wine. I was tempted to try some but the tour guide warned us our fragile foreigner stomachs would not be able to handle it. And he's not talking about the alcohol content. The language, Khemer, is rather reminiscent of Thai. In fact it shares about 4000 words with the neighbouring language. Given that my command of Thai is about as good as my Spanish (that is, limited to a few common and basic day to day words) I stuck to English, that seemed to get me by well enough, although the occasional sign language helps. Poverty is prevalent behind the veil of affluence put on for the sake of the tourists. Four star hotels and even an air-conditioned mall nestle next to a dirt road pitted with holes; every time a car goes by a cloud of red laterite dust gleefully swirls around. Apparently December is the dry season in Cambodia. 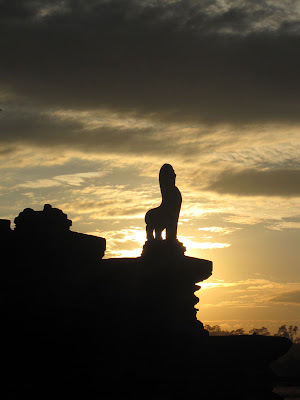 Siam Reap is very dependent on the tourism industry, so much so that the recent economic crisis has hit them very hard as the expected flood of peak tourist season has been nothing but a trickle so far. While that augurs well for me as a visitor since I hate crowds, there is a rather melancholy feeling when you're sitting in a half-filled restaurant that was obviously prepared to cater for more people than your humble self. The christmas turkey is almost visible in this picture. The dependence on tourism is so much so that the money used is transanctions in Siam Reap is a bizarre mix of US dollars and local Cambodian Riels. That is, anything above the value of 1 US dollar is traded for in US dollars, anything less than that is traded for in Riels. So Riels are something like the paper replacements for coins, which does not seem to exist here. It also involves some mental arithmetic since 1 US = 4200 Riels so if something costs $1.30 USD you end up paying 1 US dollar and 1200 Riels (I don't think I've even seen anything smaller than a 100 Riel note, so they write off the extra Riels). Odd, but interesting system. The whole of Siam Reap however, is more or less centered around the Angkor Wat. With good reason, the place is bone-chillingly awe inspiring. I spent half of today walking around what I thought WAS Angkor Wat, only to find out it was not even a tenth of the entire Angkor Wat complex. This picture was just postcard perfect. Angkor Wat is really beyond words to describe, and even the hordes of (very) pushy hawkers trying to push souvenirs onto you can't quite take away the awe of the place. The main section of Angkor Wat reminds me of CS Lewis' decription of a "Narnia within Narnia" where what you think is the temple is actually a temple around a courtyard within which lies a smaller, more magnificent temple. And within that temple is YET another courtyard with an even smaller temple in the middle. 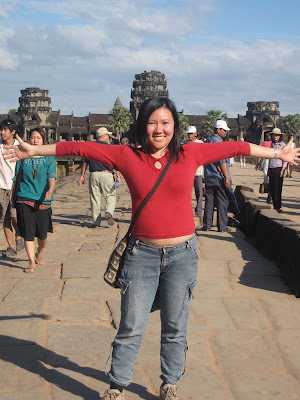 When in Angkor, do as the Khemers do? 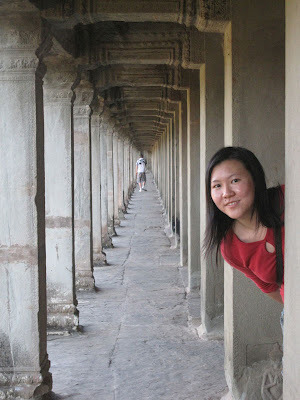 Almost every inch of the walls and archways is filled with stone carvings depicting scenes from the Hindu epics of old. Each balustrade is a giant naga, a snake/dragon kind of creature which always has odd-numbered heads (with seven heads, one for each day of the week being the highest number). 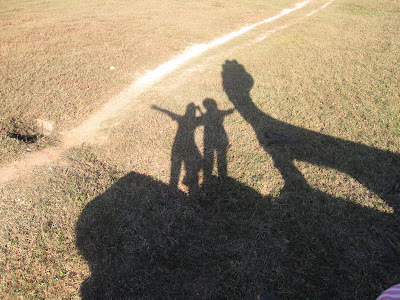 In the shadow of the Naga. I'm going to so use this effect in my comics sometime. The architecture is amazingly symmetrical and built to precision. It is so precise that if you stand at the doorway of the innermost temple, you'll see it lines up perfectly with the straight walkway to the door of the outer temple that surrounds it, and the walkway beyond that. Walking in this place is like a real life lesson in perspective. "And the vanishing point is over there!" Their stairs aren't particularly friendly to use though, the sharp 45-60 degree incline and piddly step width (about half the size of a normal step) will give anyone with vertigo a hard time. Once you get to the top the view is amazing though. There is also a sense of sadness as you walk through this place as well. When you walk through the ruins of this place and realize some of the gaps in the walls are bullet-marks, and many of the statues that used to stand in the place have been plundered or damaged and left in pieces. A stone lion standing guard. 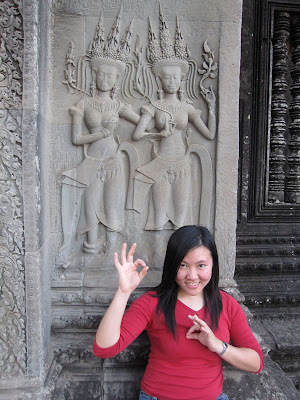 Angkor Wat, like I said, is not the only temple in the Angkor complex. There are dozens more, and to get to them you need to hire a car or tuk-tuk (basically a cab drawn by a motorbike instead of a horse). Sometimes the trip is more interesting than the temple, especially when you pass small villages and farms on the way that can yield some interesting conversation if you press your tour guide with the right questions. 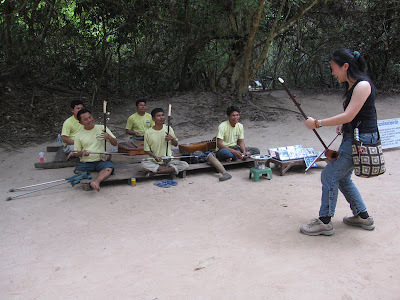 My favourite occured when we were passing an army camp on the way to Banteay Sirei. Tour Guide: That is the Cambodian Army's shooting range. For 1 US dollar a bullet tourists can go in there to learn shoot gun. (Seeing the horrified look on my mom's face). Don't worry, Madam, only they let you use the small guns only. Dad: (Curious) What kind of guns? Tour Guide: (Completely straight face) AK-47s. Of the many temples I visited, Ta Phrom stands out as the one of particular note. You may remember it from the Tomb Raider movie. Yeah, the one covered in trees. 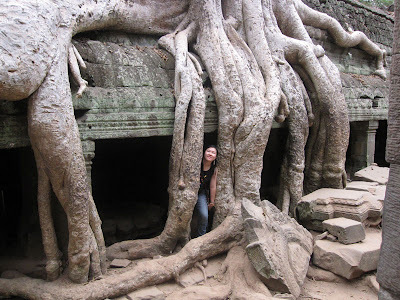 And this is why Ta Phrom is awesome and majestic. Well er... I like trees. 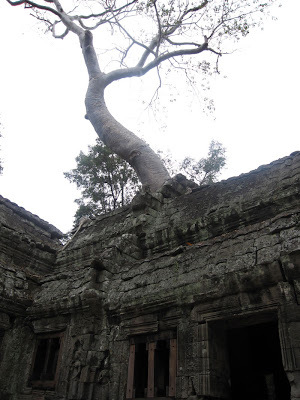 And giant trees growing in ancient temples are very interesting. It just gives the who place an added facet. I really have to come up with some fictional places in one of my comics with an architecture/nature combination like this. Angeline Jolie walked past these same roots! On the way out I ran into a quintet who were busking with some traditional asian instruments (mostly erhus and what looked like a xylophone). They stood out from your normal buskers in one way: they were all landmine victims. Most of them were missing limbs, one of them was blind. Me picking up a few pointers from the pros. 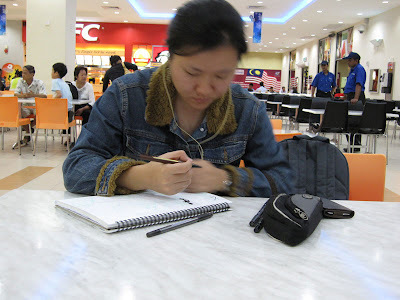 But their skill and cheerfulness was nothing short of inspiring, and I went home feeling a little awed and humbled that I still have two hands I can draw comics with. So Cambodia was different. Another one of those places out of my comfort zone, but I'm glad I went. All that said, I'm happy to be home, with all of a new year in front of me, a buffer of comics at hand and ideas for many more. The economy may suffer, and no one's immune from paycuts and layoffs, but hey... Life is still good. I just wanted to wish everyone a good New Year (I'll give you the full details later, maybe). Here's to a new year of comics!